Just past Mink Cove and just before Tiddville is the beautiful village of Little River. The community is so named for the small river running through the central part of the village. This small river fluctuates with the tide of St.Mary's Bay. Most of the people in this area are fishermen and women, although there are still a few who keep up the farming tradition. 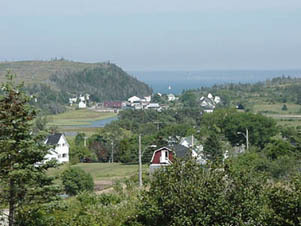 From the Little River look-off, a short wooded trail on Tommies Beach road, one can view the entire village in all its beautiful splendour. The location is a type of mini park with a picnic area, swings, and hammocks, perfect for a hiker's romantic getaway. From White's Cove you can explore the Bay of Fundy shoreline, where you can enjoy breathtaking sunsets and perhaps spot a seal or a whale. From Little Cove on the St.Mary's Bay you can view the rocky coast and see the local fishing boats and weirs. The wharf in Little River is located next to the Scotia Fisheries fish plant where you can buy fresh fish. Cherry Valley is the best place on Digby Neck for collecting driftwood and for seeing fishing weirs. People from Little River are descendants of English, Scottish and Loyalist settlers. The Baptist church built in 1899 is still a centre of activity for the community. There are some notable personalities such as the former regular summer resident, Julia Sauer, who is well loved for her books about the area like "Fog Magic." A native of Little River, Billy Smith was the son of fisherman Robert Smith. Billy went on to become the "World Welterweight Boxing Champion" in San Francisco in 1892. You can stop to get gas and food at the local general store, the Little River Trading Company. If a day of whale watching is what you would like, try "Bay to Bay Adventures" or "Whale of a Time" cruises for a glimpse of humpbacks, fins, right or minke whales. You may also see an assortment of seals and/or water birds. This is an iron mine in Little River, now closed it once produced iron ore for sale to supply the local blacksmiths.